Well after 326 cards I had one I just had to start over. It was just too much of a mess and too many mistakes in the words. 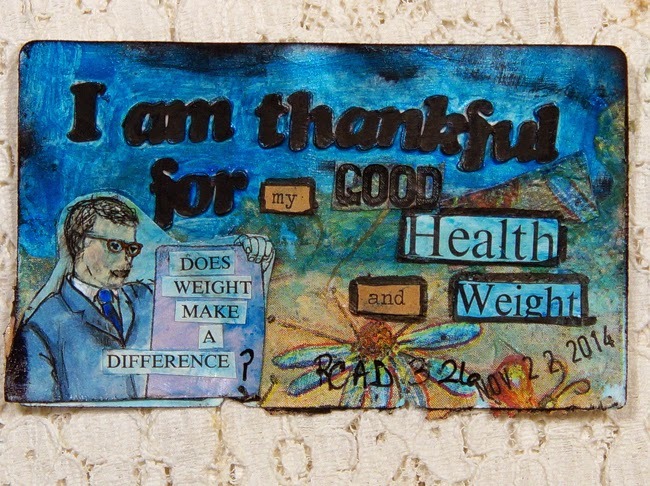 This card was created to express my gratitude for the weight I have lost and the good health I am blessed with. Here is the struggling process video. If you are in Madison, Wisconsin for the One of a Kind Rubber Stamp and Scrapbook Show, today or tomorrow, stop in the Raisin Boat booth. I will be helping with the make and take and I would love to meet you. Thanks for stopping and have a happy weekend! Congratulations Linda on meeting your goal and love the colors and fun card design.